The Ubin Project was launched in 2014 to seek ideas from the public and to build on existing efforts by the community to sensitively enhance the natural environment of Pulau Ubin, so that the island can continue to be enjoyed by future generations of Singaporeans. The Friends of Ubin Network (FUN) was formed to help achieve this. The group comprises youths, island residents, researchers, volunteers and members from the heritage and nature communities. Its work is focused on five key thrusts – Biodiversity Conservation, Education and Research, Nature-based Research, Sustainable Design and Practices, and Community, Heritage and History. We look at some recent highlights in these areas. Pulau Ubin is a key sanctuary for many endangered species, some of which are not found on mainland Singapore. Staff and volunteers work to conserve and reintroduce Pulau Ubin’s native biodiversity through habitat enhancement and species recovery programmes. Different groups, from schools to private organisations, have helped to restore forest, freshwater wetlands and mangroves, creating hospitable environments for native species and in turn increasing their natural populations. The Lesser Whistling Duck enjoying the Sensory Trail Pond. The Sensory Trail Pond has been carefully landscaped and planted up to provide habitats for water birds and other wetland wildlife. The Lesser Whistling Duck (Dendrocygna javanica) is one such species recorded at the pond. Ngee Ann Polytechnic students helped with the planting around the Sensory Trail Pond, improving the habitat to attract water birds and other wetland wildlife. Meanwhile, students from the ITE College East were involved in planting trees at the bird species recovery site at Ketam Mountain Bike Park. This project was targeted at providing more nesting habitats for the Baya Weaver (Ploceus philippinus), Blue-throated Bee-eater (Merops viridis) and Red-wattled Lapwing (Vanellus indicus). Students also assisted in monitoring bird life at Ketam Mountain Bike Park after works were completed. More nesting sites have been provided at Ketam Mountain Bike Park for three bird species – the Baya Weaver, Blue-throated Bee-eater and Red-wattled Lapwing. Using an endoscopy camera, students from ITE College East help to survey the underground artificial holts, to look out for possible activities by otters. Artificial holts or dens have been designed to resemble natural holts and installed on Pulau Ubin for the Asian Small-clawed Otter (Aonyx cinereus). The activities within and around the artificial holts are regularly surveyed by the students from ITE College East. Camera traps have also been installed to monitor activity by the otters. Camera-trap footage show the Asian Small-clawed Otter using the artificial holt installed on the island. About 30 bat boxes have been installed around Pulau Ubin to provide additional roosting options and to attract new bat species to the island. Students from ITE College East constructed the bat boxes that were designed by Republic Polytechnic students, who in turn assisted in monitoring the number of bats that use these boxes. The Lesser False Vampire bat (Megaderma spasma) has taken up residence in the newly constructed bat houses and a group is being monitored closely. Since 2016, their numbers have been slowly but steadily increasing. ITE College East students (left) constructed bat boxes that were designed by students from Republic Polytechnic. There are now some 30 such boxes on the island providing additional roosting sites for bats. The Lesser False Vampire bat has taken up residence in a newly constructed bat house. Researchers from the National University of Singapore and NParks work together to map the elevation of the abandoned prawn farming ponds at Sungei Durian, part of the community-led Restore Ubin Mangroves (R.U.M.) initiative. The Restore Ubin Mangroves (R.U.M.) initiative seeks to restore mangroves in abandoned aquaculture areas on the island. It brings together experts and volunteers from organisations such as the Mangrove Lab at the Department of Geography, National University of Singapore (NUS), Nature Society (Singapore), Sea Angels and WildSingapore. Using the Ecological Mangrove Restoration (EMR), which is a science-based approach, site characteristics such as elevation and hydrodynamics are considered to recreate favourable physical environmental conditions that encourage natural regeneration of mangroves. Members of the R.U.M. initiative also conduct guided walks and coastal clean-ups around mangroves of Pulau Ubin. A two-day workshop was held in February 2018 to build capacity for shoreline restoration through the use of mangroves. Speakers shared the findings of the EMR study conducted by NUS and NParks while different stakeholders were able to discuss and exchange views on this matter. The Ubin Living Lab is an integrated facility set up in 2016 for field studies, education and community outreach. It has been used by more than 6,000 participants from over 130 groups. A water treatment system, toilet and shower facilities was completed in mid-2018, facilitating students and researchers who need to stay overnight for research and educational activities. It also houses the mangrove arboretum which showcases a collection of 34 ‘true’ mangrove species that can be found in Singapore. The arboretum plays a major role in conserving Singapore’s biodiversity through the propagating and planting of native mangrove species. In the long run, these trees could supplement restoration efforts across the island. Mangrove forests are vital to the coastal zone in Pulau Ubin as they protect the shoreline from erosion and serve as habitats for a wide range of wildlife. Volunteers are also contributing to an ongoing two-year Comprehensive Ubin Biodiversity Survey that aims to update existing biodiversity baseline data as well as establish new baseline inventories. Data collected from the survey will aid in the planning of future research, habitat enhancement efforts and species recovery projects. Sign up at nparks_pulau_ubin@nparks.gov.sg if you are interested to volunteer with us for the survey! Volunteers attend training to prepare them for conducting the Comprehensive Ubin Biodiversity Survey. Here, they are learning to install camera traps prior to the start of the survey. Caption: The revamped content on the interpretative panels, 3D displays and interactive touchscreen at Nature Gallery highlight the biodiversity and cultural heritage of Pulau Ubin as well as NParks’ efforts in conservation, education, research and recreation. Caption: Teck Seng’s Place is an authentic Chinese kampong house that has been refurbished and is open for the public to visit and learn about Pulau Ubin’s cultural heritage. Local Ubin community contributed many old photographs, historical objects and special antiques for the newly refurbished Nature Gallery and Teck Seng’s Place. Thanks to these unique mementoes, visitors to both locations can gain valuable insight into how life was on the island in the days past. Volunteers have also been integral in educating the public about the flora and fauna found on Pulau Ubin. Many provided photographs and shared their knowledge to help NParks put up interesting and insightful interpretive sign boards at Butterfly Hill, Sensory Trail and Chek Jawa Wetlands. Over at the Ubin Fruit Orchard, over 30 species of fruit trees such as well-known favourites like Durian, Rambutan as well as the less familiar Rambai and Pulasan were planted by students from Ngee Ann Polytechnic. Subsequently, students from Nanyang Girls’ High School researched the various species planted and designed educational signboards for the benefit of all visitors. 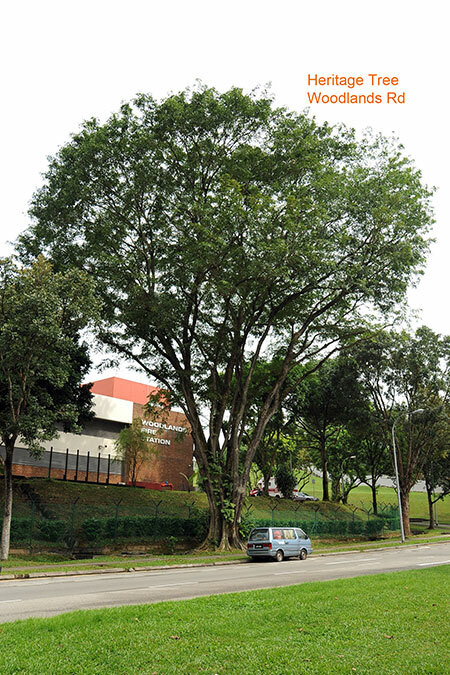 Caption: The educational signboards designed by Nanyang Girls’ High School allowed visitors to find out more about the different kampong fruit trees. Join us on guided tours such as the Chek Jawa Wetlands Tour, Kampong Tour and Rustic Reflections Tour! Other interesting places to visit includes Puaka Hill and Pulau Ubin Tree Trail. Initiated and collectively drawn up through FUN, the Ubin Way is a code of conduct designed to encourage visitors to adopt ecologically and socially responsible behaviours while on the island, and to learn more about the villagers by engaging them in friendly conversation. Some have also pledged their commitment towards zero waste activities through actions like not providing disposable plastic bottles of water and requiring participants to bring their own reusable bottles which can be filled with water from water dispensers. To help spread the message, signs have been installed across the island while a video screened at the Changi Point Ferry Terminal, helps inform visitors of these behaviours as they wait to board the ferry to the island. Visitors are encouraged to adopt The Ubin Way, a code of conduct that encourages visitors to be more ecologically and socially responsible while on the island. The Ubin Project also supports and encourages groups to come together to organise and lead initiatives that help make a difference on the island. Key efforts over the past few years include the annual open house festival Pesta Ubin, Balik Kampong Party and the restoration of kampong structures. Balik Kampong, held by Kawan Ubin on 24 February 2018, reunited close to 140 current and former Ubin residents and their families. Kawan Ubin is a group led by members of the Singapore Heritage Society as part of the FUN Network. Organisers hope that this event will be the first in a series of community get-togethers, so as to strengthen cohesiveness amongst Ubin residents, reviving a collective sense of belonging, and reinvigorating the community. The Balik Kampong get-together included games, dinner, a documentary screening and even a lo-hei session. Pesta Ubin is a yearly event for Pulau Ubin volunteers and stakeholders to come together as one community to celebrate the island’s beauty as well as its natural and cultural heritage. The event took place from 26 May to 24 June this year with multiple exciting activities organised for, and by, the community. 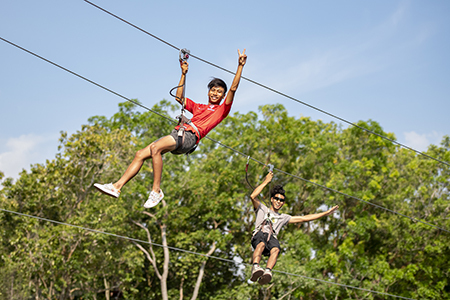 About 40 groups organised activities that featured different aspects of Ubin, such as its landscape, heritage, kampong life and outdoor experience. These activities offered wholesome fun for the family, especially children and youths, and visitors could learn about wildlife conservation and the island’s heritage. Pesta Ubin 2018 culminated in Ubin Day, which unveiled improved facilities at Ubin Living Lab and record of five new species discovered on Pulau Ubin. A Chinese language book, translated as ‘Bin Kiang: Our Heart and Soul’, produced by the community, was also launched. This collection of stories about villagers living on the island after WWII is a fitting keepsake that helps keep the heritage and rustic charm of Pulau Ubin alive for generations to come. University students and members of the Singapore Heritage Society worked together to rebuild Ah Ma’s Drink Stall, preserving a unique part of Ubin’s heritage for future generations. A group of Architecture students from National University of Singapore worked with Singapore Heritage Society, Sea Angel, NParks and Ministry of National Development (MND) to rebuild Ah Ma’s Drink Stall in 2018. The famous drink stall was in a deteriorating condition, especially as ground settlement has destabilised the structure. It was the first kampong structure to be rebuilt on the island in 20 years and served as a test bed for the construction and rebuilding of future kampong houses on Pulau Ubin. Local villagers also shared their traditional construction knowledge with the students. After two months of construction, Ah Ma’s Drink Stall was reopened on 23 September 2018. Meanwhile, NParks and the ISEAS-Yusof Ishak Institute started the first in-depth archaeological survey on the island, beginning with World War II historical artefacts. It documented remnants of a WWII gun emplacement of the British Ubin Anti-Motor Torpedo Boat Battery which is located within Camp Resilience (National Cadet Corps Campsite). Information from these surveys will be incorporated into educational posters and presentations as part of efforts to strengthen awareness about Pulau Ubin’s cultural and natural heritage. 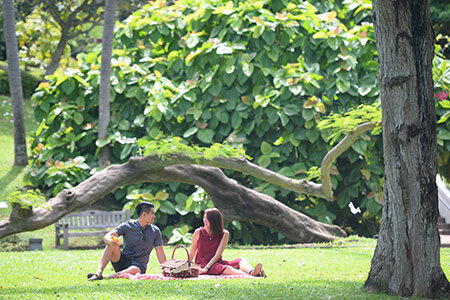 It will complement ongoing cultural, heritage and biodiversity research on the island, serving as a guide for NParks to develop management strategies for these areas to conserve the island heritage. Caption: NParks and the ISEAS-Yusof Ishak Institute are documenting the remnants of a WWII gun emplacement of the British Ubin Anti-Motor Torpedo Boat Battery, the first in-depth archaeological survey on the island. This is adapted from articles that ran originally in Ubin Tides issues 1 and 2, first published in 2018.